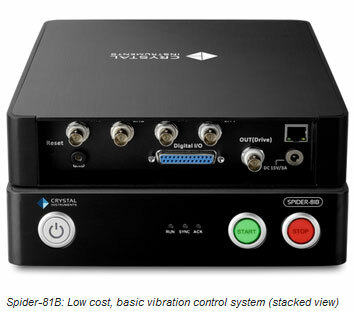 KB Engineering features sine, random, and shock vibration controllers from Crystal Instruments. Included in the offering are sine controllers, random controllers, shock controllers, sine-on-random controllers, random-on-random controllers, and vibration controller software. SRC, time waveform replication, multiple shaker control, high channel count, and precise data acquisition are just some of these products’ features. Basic signal analyzers, handheld dynamic signal analyzers, and strain gages are also a part of our offering that can be accessed from this page. Crystal Instruments' instrumentation products integrate the know-hows of electronics, sensor and measurement technology, control theory, digital signal processing, structural testing and physics, environmental simulation, and the software programming technology at different layers from firmware to cloud service. Crystal has been leading innovation in vibration testing, condition monitoring, and data acquisition since 1996. KB Engineering can help you expertly leverage these devices to your custom application. Start by calling 1-616-399-2728. The Spider-81B vibration test controller is developed to meet the requirements of basic vibration testing applications. It has 4 inputs, 1 output, and 4 pairs of digital I/O. The software includes the Random, Sine, Shock, and RSTD testing suites. The Spider-81B vibration test controller runs autonomously in Black Box mode without a PC connected. In this mode, a PC is used only to configure the control system before operation and to download data after the test is complete. During the test, the vibration test controller operates according to a preset schedule or from a choice of external devices using the digital I/O interface. The Spider-81 software is further improved at the user interface level. More graphic guidance, wizards, and tools were added to make setup a snap. The interface has been rearranged to make it more logical and more useful. Event-Action rules, Abort-Sensitivity, and other new interface features are used to simplify operation. Searching through a large number of tests is easy with keywords.